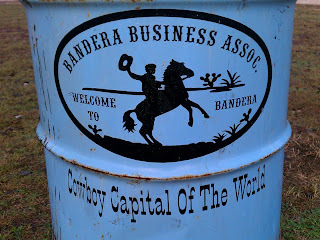 Most of you know my end result at Bandera this year, so let's dive into all the other memorable parts of the weekend. I decided to fly out on Thursday night instead of Friday. I wanted a little extra time to hang out and see San Antonio. Thus I flew into Austin and drove to Bandera that night. The next morning I took an easy jog along the river across from my motel/cabin. The park had a dirt path that followed the Medina River for about a mile. Perfect. No doubt about where I was. The morning was pristine and the river was glass. Click on the pic to see the crazy ladder up the tree and the rope swings. Fun times in the summer for sure! The deer population in Bandera is doing just fine. By 9am, I was cleaned up and ready for the 40 mile drive to San Antonio. With fairly limited time, my destination was the touristy River Walk area. Once I parked my car, it was easy to get down to the river except I had no clue where to go and didn't feel like walking for miles. Voila! Along came a water taxi. I had no idea the River Walk goes on for miles and miles and my taxi was heading in the direction away from downtown. I actually didn't mind because the driver was a nice guy and I was his only passenger. He made it clear that he wasn't a tour guide, but then proceeded to talk non-stop about all the stuff we were passing. We cruised for about 45 minutes before we finally arrived back in the restaurant section. Trying to scout out a lunch spot. I couldn't visit SA without the requisite shot of the Alamo. By early afternoon I was ready to head back north for the pre-race meeting. After a quick lap around the Alamo, I hopped into the car and enjoyed the relatively short drive back to Bandera. If anyone needs a mechanic that's honest and will tell you like it is, this is the place to go. Oh yeah, the race. I almost forgot. One of the things I remember most from last year was that if you try to run this race with any small aches & pains, this course will slowly, but surely expose that weakness and completely attack it during the second half. This would prove true again this year. Saturday morning was cool, but perfectly comfortable in shorts and a t-shirt.. All the pre-race prep went off without a hitch. While standing at the start line I met Darcy Africa. Cool lady and fun to chat it up with another Coloradoan. About 10 minutes until "go" time. Greeting the rising sun from atop Sky Island. One thing that stood out to me within the first few miles was how quickly I got separated from the pack. The real fast guys & gals were up ahead and out of sight, but there was no one else around me by mile 3-4. Last year I ran the first 31 miles around a bunch of people. Heading over to Ice Cream Hill. Certainly not a sweet treat. For the first few hours, there was a perfect cool breeze. I couldn't ask for better conditions to run in after all the cold and snow in Colorado. Oh, and to just have dry dirt to run on - It was bliss. Sure there were a few rocks mixed in, but I was seriously having the time of my life and cruising at a comfortable pace. I know the course was just chuckling away knowing how good it was going to get me later. The typical Bandera trail with the infamous leg shredding Sotul. The slicing Sotul plant didn't seem that bad this year, but it sure did look lush and taller than I remember. Not only did my knees & ankles get bloodied up again, but my thighs and fingers (ouch!) got their fair share of cuts too. I kept telling myself it's all part of the unique Bandera experience! The Field. It's flat, long and a bit mind-numbing. At about mile 19, I caught up to Pam Smith (eventual 3rd place woman). She was in a rough patch and struggling. I tried to say something nice, but figured she probably didn't want to talk. It wasn't long before I looked behind me and she was no where to be seen. Catching a few back of the pack 25k folks heading up Lucky Peak. I don't remember where they took this pic, but why not stick it here. The trail you're "lucky" to encounter at the top. The descent of either Cairns Climb or Boyles Bump. Can't remember which, but they're both the same. It was around mile 28 that I caught up with Darcy. At this point, I knew I was either running a great race, or she was just having a really bad one. The answer was the latter. She had issues with her hamstrings before the race, and you bet they were not feeling good after 28 miles on Bandera trails. She said she was going to drop at the turnaround. I was bummed for her, but knew she was making the right decision. Her race schedule is always intense and another lap around the Hill Country SNA could easily set her back. We parted ways and I ran into the turnaround in 4:40 feeling great. After a few minutes to load up, I was heading back out for round two. I remember dreading this moment last year as my blisters had already formed. This year was much different. I wasn't running as fast, but overall felt just fine. Within a half mile, I heard footsteps behind me and who should appear? Pam Smith. The new Pam Smith I should say. She was chipper and running strong. We chatted for a bit about her rough patch and then off she went. By mile 35 she was gone and I was starting to get concerned as my knee began to ache. The story starts to wind down here. I ran slower and slower as the ache increased. The rocks were doing what they do best. Even though I felt 100% going into the race, clearly that wasn't the case. Miles 37-45 were spent debating between what I could do to make it better or whether I should even keep going. Meanwhile the breeze had disappeared and the temps had climbed significantly. I had stopped eating and felt the hole I was in was just too great to overcome this day. The decision was made to drop. The last three miles to the aid station (mile 48) were spent getting down on myself because my aunt, uncle, and cousin would be waiting there to see me for the first time all day. All they would get to see is me walking in with the news it was over. In my few years of running, this was my first DNF. It felt a bit weird to take off my chip, grab my drop bag and drive away. There was no finish line, no "I did it" moment, no closure. I was left with a pit in my stomach and the dread of having to explain to everyone who knew I was running Bandera why I couldn't finish. Yes, it was the right decision, but it was a sucky one. Well, it quickly gets much better now. My Aunt Hildy, Uncle David, and cousin Rachel were so awesome! They drove me back to Austin while we listened to the Texans beat up on the Bengals. They fed me some scrumptious food and we talked for hours. Rachel & I got to talk running as she's a month away from her first half marathon in February. I got to witness her going out and rocking her longest training run ever on Sunday! All in all, I thoroughly enjoy their company and can't thank them enough for giving up their weekend and taking such good care of me. Here it is Jaime! Check out these babies! I ate four of them. In closing, I remember when Brandon DNF'd at Leadville last summer and blogged about the experience. He had been shooting for the big buckle and it wasn't his day out there. My favorite part of his story came when he got home. His daughter was waiting with a homemade big buckle. Man, I got all choked up when I saw this picture. Well, I returned home late Sunday night to find this note on my pillow. My youngest, Zoe, had worked all weekend on this story. Just for me. It's a little silly in parts and her spelling is coming along, but you'll quickly see why there is no way my life will get hung up by DNFing at a race. I have so much to be thankful for and my family will always be the biggest blessing in my life. Once again, this race didn't go as planned. I ran a great first lap in 4:40 and then encountered knee soreness around mile 36 that slowed me way down. Walking felt better, but running produced a radiating pain all around the knee I whacked a month ago. I tried to work through it over the next 11 miles, but it became apparent my only option was to walk the rest or drop. So I dropped at the next aid station (mile 47). I'm definitely disappointed, especially with my knee feeling fine now. I can only guess it wasn't 100% healed up and became inflamed after several hours of hopping rocks. Without a doubt, I'll be back (hopefully next year). I had an awesome time this weekend and the race result is the only sour spot. I'll put out a race report with pics in the coming days. What an awesome year 2011 was! Is that due to running more than I have in the past? All my races but two were on trails? Bagging a 100 miler? 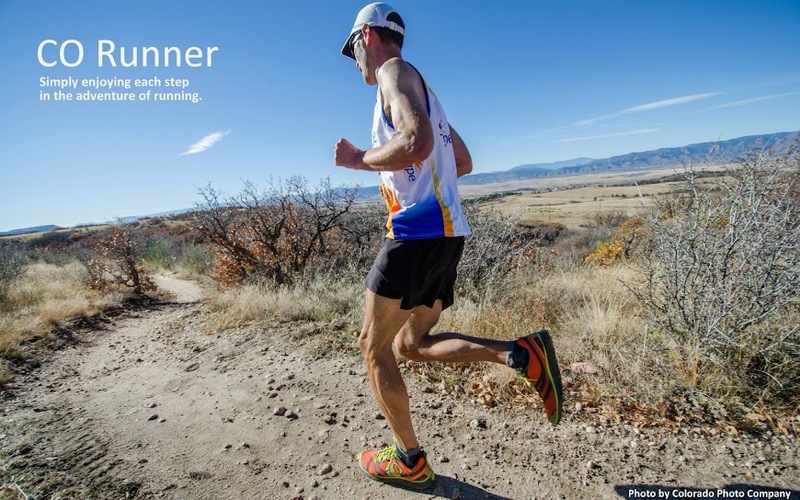 Running in the San Juans? Awesome trail runs with friends? All of the above? I won't rehash everything that I've already blogged about, so let's look forward to this year. My goals for 2012 will continue to be simple. Push the pace a bit more during training runs. Keep running races since they motivate me to get out the door when my body is saying "sleep in". Take a few more risks during those races. Keep running with friends whenever possible. And keep enjoying each run while living in the moment. When asked by my wife right before the start of the LT100 what I was looking forward to most, I responded, "Living in the moment...maybe?" That off the cuff response has stuck with me the rest of the year as it has helped me to appreciate each day and season for what it has to offer. Why fret over the past? Why stress about the future? Rain/Sun/Snow/Wind/Heat/Cold? Why worry about things I can't control? Our church is in a series on "Be Happy" and there are so many things that resonate with how running makes me happy. * Jason was 14 when he wrote this poem. It was published in a Dear Abby column, on February 14th 1989. So we're off and running in 2012 already. Bandera is a kick in the pants way to get it started. It's quite possible I won't achieve any redemption there, and that's okay. I'm just happy for another day to run and that my training has given me the chance to improve.